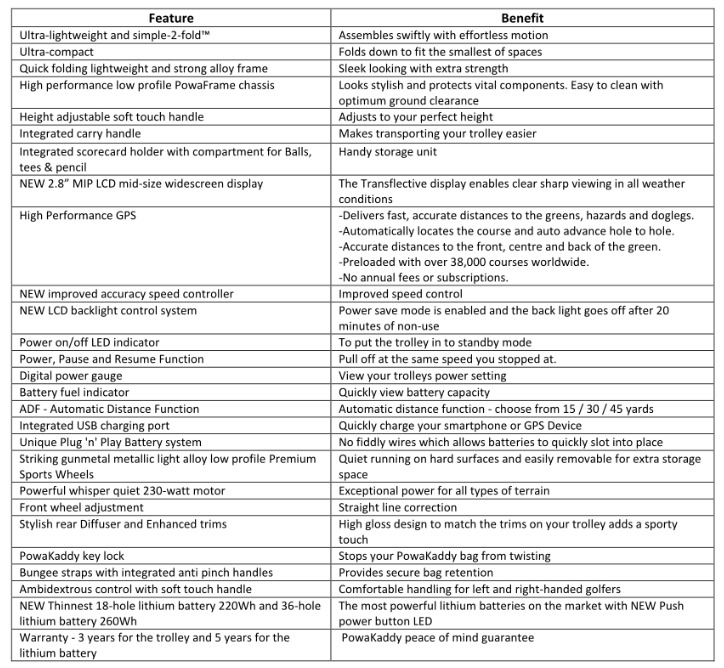 Introducing the updated version of the incredible C2i Compact Electric Golf Trolley from PowaKaddy® Golf. This model from the range features a Lithium Battery that's been designed to complete at least 18 holes of golf and 2019 updated features! This latest model, the C2i GPS/EBS comes with a fully integrated GPS System pre-loaded inside the high tech handle, and with Blue Tooth capabilities, updates and additional golf course layouts can be added from your mobile phone or tablet with ease. The EBS (Electronic Braking System) provides 3 levels of progressive braking when going downhill. 20% SMALLER than the nearest competitor! The PowaKaddy 2019 Compact C2i Fits into the smallest of car boots and is 20% smaller than its nearest competitor. Powered by the thinnest, lightest & most powerful Lithium battery on the market. There is compact –then there’s ultra-compact! The all New 2019 ultra-compact PowaKaddy C2i folds in 2 simple steps.